The set-up of PU and polyurea coating operations. Dubai-based Prime Seal Insulation and Protective Materials, a supplier of innovative products for polyurea coating and polyurethane (PU) foam insulation, has expanded its operations to Saudi Arabia. Prime Seal serves the region with materials, machinery and innovative products for the thermal insulation, roofing and waterproofing, protective coating and anti-corrosion industry. It represents world-class manufacturers, including those based in the US and Europe, for high-quality, low-maintenance, and user-friendly plural component spray or pour equipment, advanced polyurethane equipment for production of sandwich or cold storage panels or chest freezers, single or multi-component coating and road-marking machinery. It also supports the market with high-quality polyurea, PU foam and coatings stocked in its facility. The company has received good responses at major construction events such as Saudi Build 2015 and The Big 5 Dubai, according to Abdul Rahman Al Omran, managing director, Prime Seal Saudi Arabia, a member of Al Mazro Group. “Our company has a team of technical experts with several years of experience in thermal insulation, waterproofing and anti-corrosion industry,” says Yacoob Hassan, managing director for UAE operations, who pioneered the introduction of PU chemical system houses in the emirates. Prime Seal claims it leads the GCC, Middle East, Africa and the Indian Subcontinent markets with innovative technology in the thermal insulation and the protective coating sector. “We are the largest providers of anti-corrosion protective tapes, specialised coatings, Handifoam kits and water pumps from world’s leading producers,” says general manager Suneer Hakkim, who has been involved in the supply of anti-corrosion and protective materials for the last 12 years to several reputed contractors and government projects in the GCC. Prime Seal ... wide range of protective and anti-corrosion services. Polyurea is used as industrial coatings in severe environments and offers good chemical resistance to hydrocarbons, hydrogen sulphide gas and immersed sewage applications. The product can withstand extremely cold temperatures of up to -40 deg C without any cracks or blisters. 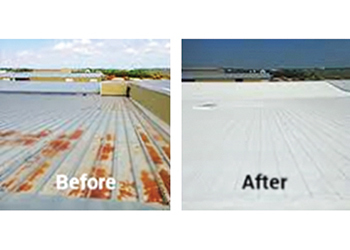 “The use of polyurea-based thick film coating materials for substrate protection and corrosion prevention has seen an exponential rise in the marketplace in the past 15 years or so,” says Hassan. He says these coatings cure rapidly and are compliant with volatile organic compound (VOC) regulations and are high build, so they can provide multiple coat performance in a single coat application, making them attractive to facility owners representing many different industries. Polyurea-based thick film coatings encompass a diverse group of products. Pure polyurea is a combination of isocyanate with a long chain amine, excluding the hydroxyl reactive sites. 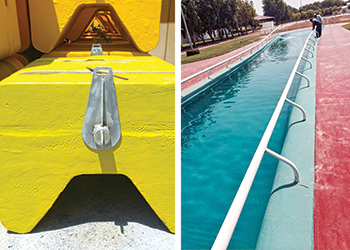 Polyurea coatings can be formulated as hybrids by combining isocyanate with a mixture of polyols and long chain amines, resulting in a coating that bears the performance characteristics of a polyurethane and a polyurea coating. Polyurea coatings can be either aromatic or aliphatic, and can be formulated with catalysts, pigments, fillers and other performance-enhancing additives. Applications of pure polyurea coatings include sewage treatment plants, USDA-approved food plants, secondary containment, lead encapsulation, balcony decks, and fishing ponds, and many more. Hassan says Prime Seal supplies polyurea from Polycoat USA, which produces two-component cold or hot applied polyurethane, polyaspartic and epoxy resins for continuous flooring. “These products are available from our UAE and Saudi facilities,” he adds. Polyurea coatings can be applied for sewage treatment plants. RIGHT: Polyurea-based coatings prevent corrosion. Prime Seal distributes reliable and high quality plural component dispensing machinery from European and US manufacturers. Gama from Spain produces its flagship product, G-50H Proportioner, with innovative features including data logger and Mono bloc pumps for longer life with anti-leak technology. “This is the only machine in the market that can spray large quantities of polyurethane foam, polyurea coatings or similar plural component materials in a single unit without requiring to replace pumps. The pressure gauges can read up to 3,500 psi with its in-built 120 size pumps,” says Hassan. Another company, Polyurethane Machinery Corporation (PMC) produces conventional-type PU foam or polyurea dispensing units with special features. These use relays and breakers – not printed circuit boards – so the cost to repair a console is minimal compared to replacing expensive circuit boards. A selectable count-down device can be pre-set by the operator to interrupt the operation of the pump circuit before the drum becomes empty. 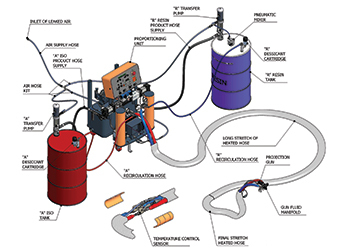 The units are equipped with an automated isocyanate lubrication system. “The majority of roofing contractors are now changing their existing machines to Gama and PMC hydraulically operated units from their existing electrical units due to prolonged life and user-friendly features,” concludes Hassan.